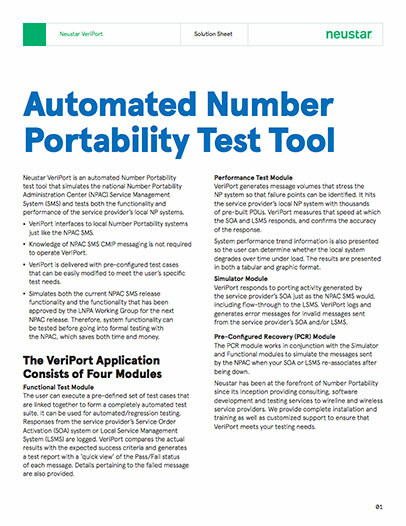 Neustar VeriPort is an automated Number Portability test tool that simulates the national Number Portability Administration Center (NPAC) Service Management System (SMS) and tests both the functionality and performance of the service provider’s local NP systems. VeriPort interfaces to local Number Portability systems just like the NPAC SMS. Knowledge of NPAC SMS CMIP messaging is not required to operate VeriPort. VeriPort is delivered with pre-configured test cases that can be easily modified to meet the user’s specific test needs. Simulates both the current NPAC SMS release functionality and the functionality that has been approved by the LNPA Working Group for the next NPAC release. Therefore, system functionality can be tested before going into formal testing with the NPAC, which saves both time and money. The user can execute a pre-defined set of test cases that are linked together to form a completely automated test suite. It can be used for automated/regression testing. Responses from the service provider’s Service Order Activation (SOA) system or Local Service Management System (LSMS) are logged. VeriPort compares the actual results with the expected success criteria and generates a test report with a ‘quick view’ of the Pass/Fail status of each message. Details pertaining to the failed message are also provided. VeriPort generates message volumes that stress the NP system so that failure points can be identified. It hits the service provider’s local NP system with thousands of pre-built PDUs. VeriPort measures that speed at which the SOA and LSMS responds, and confirms the accuracy of the response. System performance trend information is also presented so the user can determine whether the local system degrades over time under load. The results are presented in both a tabular and graphic format. VeriPort responds to porting activity generated by the service provider’s SOA just as the NPAC SMS would, including flow-through to the LSMS. VeriPort logs and generates error messages for invalid messages sent from the service provider’s SOA and/or LSMS. The PCR module works in conjunction with the Simulator and Functional modules to simulate the messages sent by the NPAC when your SOA or LSMS re-associates after being down. Neustar has been at the forefront of Number Portability since its inception providing consulting, software development and testing services to wireline and wireless service providers. We provide complete installation and training as well as customized support to ensure that VeriPort meets your testing needs.